It is not common to describe Chinese language as having prefixes and suffixes. However, there are some characters that can give a clue about the possible meaning of a word or phrase. 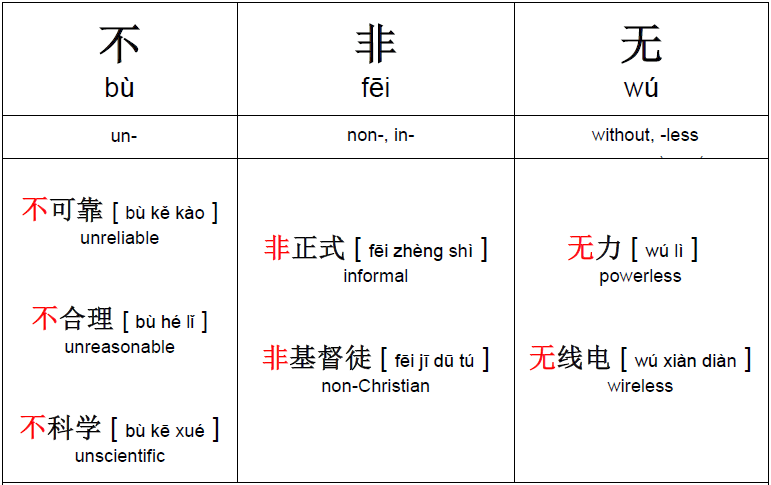 These are prefixes that are used to negate Chinese adjectives and some other parts of speech. The meanings of these prefixes vary slightly. 不 is commonly used in all sorts of situations. 非 is formal. It is more likely to be ssen in formal notices and law-related texts. Using of 无 is more typical for "written" Chinese than for colloquial language.